Within the constructor of AlbumForm we do several things. First, we set the name of the form as we call the parent’s constructor. we create four form elements: the id, title, artist, and submit button. For each item we set various attributes and options, including the label to be displayed. HTML-Forms can be sent using POST and GET. ZF2s default is POST, therefore you don’t have to be explicit in setting this option. If you want to change it to GET though, all you have to do is set the specific attribute in the constructor. The InputFilterAwareInterface defines two methods: setInputFilter() and getInputFilter(). We only need to implement getInputFilter() so we simply throw an exception in setInputFilter(). Within getInputFilter(), we instantiate an InputFilter and then add the inputs that we require. We add one input for each property that we wish to filter or validate. For the id field we add an Int filter as we only need integers. For the text elements, we add two filters, StripTags and StringTrim, to remove unwanted HTML and unnecessary white space. We also set them to be required and add a StringLength validator to ensure that the user doesn’t enter more characters than we can store into the database. We instantiate AlbumForm and set the label on the submit button to “Add”. We do this here as we’ll want to re-use the form when editing an album and will use a different label. If the Request object’s isPost() method is true, then the form has been submitted and so we set the form’s input filter from an album instance. We then set the posted data to the form and check to see if it is valid using the isValid() member function of the form. If the form is valid, then we grab the data from the form and store to the model using saveAlbum(). After we have saved the new album row, we redirect back to the list of albums using the Redirect controller plugin. Finally, we return the variables that we want assigned to the view. In this case, just the form object. Note that Zend Framework 2 also allows you to simply return an array containing the variables to be assigned to the view and it will create a ViewModel behind the scenes for you. This saves a little typing. Again, we display a title as before and then we render the form. Zend Framework provides some view helpers to make this a little easier. The form() view helper has an openTag() and closeTag() method which we use to open and close the form. Then for each element with a label, we can use formRow(), but for the two elements that are standalone, we use formHidden() and formSubmit(). Note: You still need to call the openTag and closeTag methods of the form. You replace the other echo statements with the call to formCollection, above. This will iterate over the form structure, calling the appropriate label, element and error view helpers for each element, but you still have to wrap formCollection($form) with the open and close form tags. This helps reduce the complexity of your view script in situations where the default HTML rendering of the form is acceptable. You should now be able to use the “Add new album” link on the home page of the application to add a new album record. params is a controller plugin that provides a convenient way to retrieve parameters from the matched route. We use it to retrieve the id from the route we created in the modules’ module.config.php. If the id is zero, then we redirect to the add action, otherwise, we continue by getting the album entity from the database. We have to check to make sure that the Album with the specified id can actually be found. If it cannot, then the data access method throws an exception. We catch that exception and re-route the user to the index page. When displaying the form, the initial values for each element are extracted from the model. After successful validation in isValid(), the data from the form is put back into the model. As a result of using bind() with its hydrator, we do not need to populate the form’s data back into the $album as that’s already been done, so we can just call the mappers’ saveAlbum() to store the changes back to the database. The only changes are to use the ‘Edit Album’ title and set the form’s action to the ‘edit’ action too. You should now be able to edit albums. To round out our application, we need to add deletion. We have a Delete link next to each album on our list page and the naive approach would be to do a delete when it’s clicked. This would be wrong. Remembering our HTTP spec, we recall that you shouldn’t do an irreversible action using GET and should use POST instead. We shall show a confirmation form when the user clicks delete and if they then click “yes”, we will do the deletion. As the form is trivial, we’ll code it directly into our view (Zend\Form is, after all, optional!). As before, we get the id from the matched route, and check the request object’s isPost() to determine whether to show the confirmation page or to delete the album. We use the table object to delete the row using the deleteAlbum() method and then redirect back the list of albums. If the request is not a POST, then we retrieve the correct database record and assign to the view, along with the id. In this script, we display a confirmation message to the user and then a form with “Yes” and “No” buttons. In the action, we checked specifically for the “Yes” value when doing the deletion. One final point. 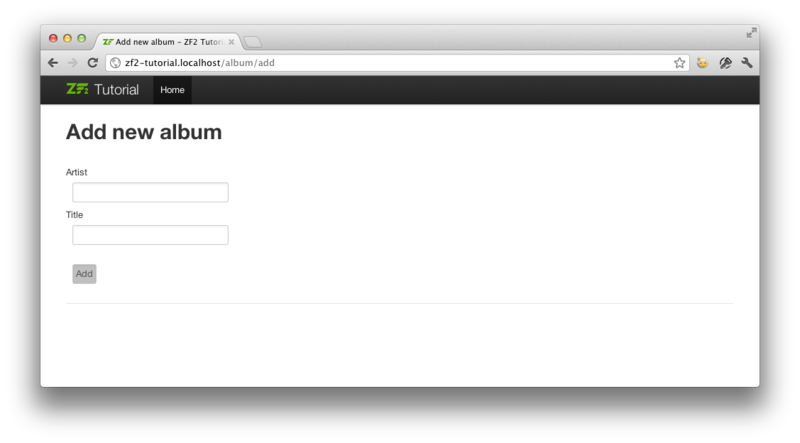 At the moment, the home page, http://zf2-tutorial.localhost/ doesn’t display the list of albums. That’s it - you now have a fully working application! Go to Forms and actions on GitHub.